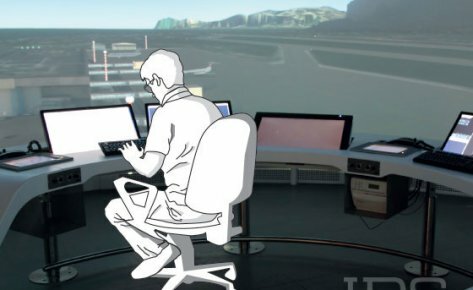 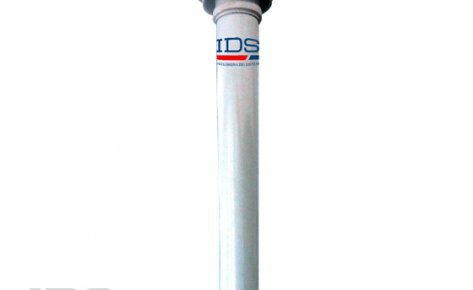 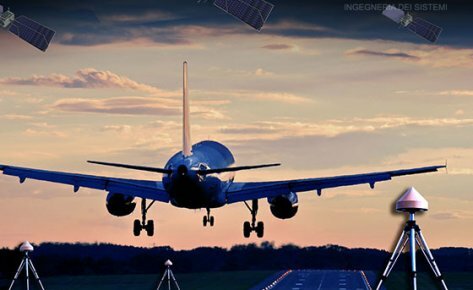 A-BMS Aeronautical Billing | IDS Ingegneria Dei Sistemi S.p.A.
A-BMS collects flight data by interfacing with Radar Data Processing (RDPS), Flight Data Processing (FDPS) and AMHS / AFTN systems to ensure accurate billing of airspace usage. 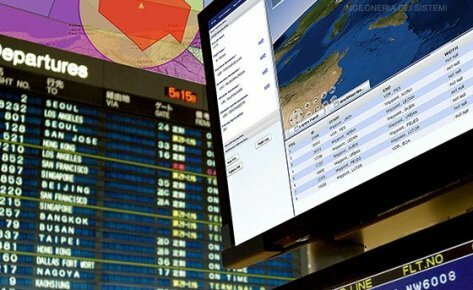 It allows ANS providers to fully manage the accounts of airspace users, to gather the details of planes and pilots, facilitate payments and manage account status. 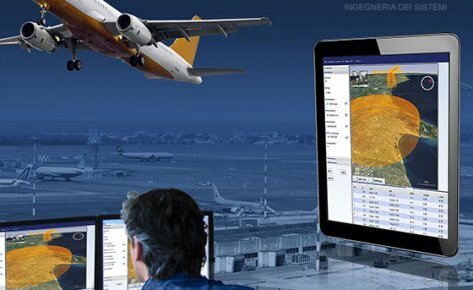 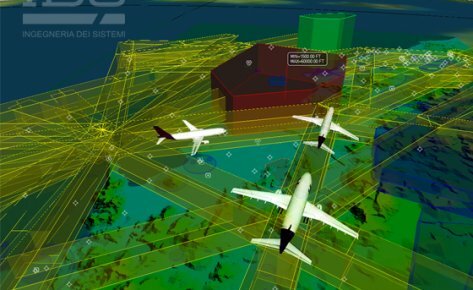 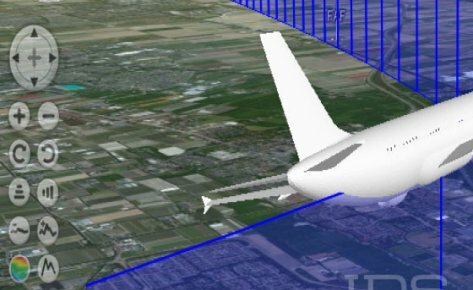 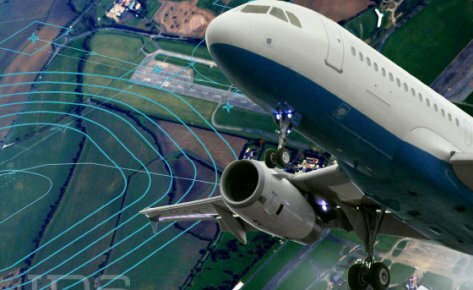 A-BMS’s versatile architecture allows it to be used by all providers of Air Navigation Services from general aviation services and private airfields up to commercial aviation and national ANSPs. 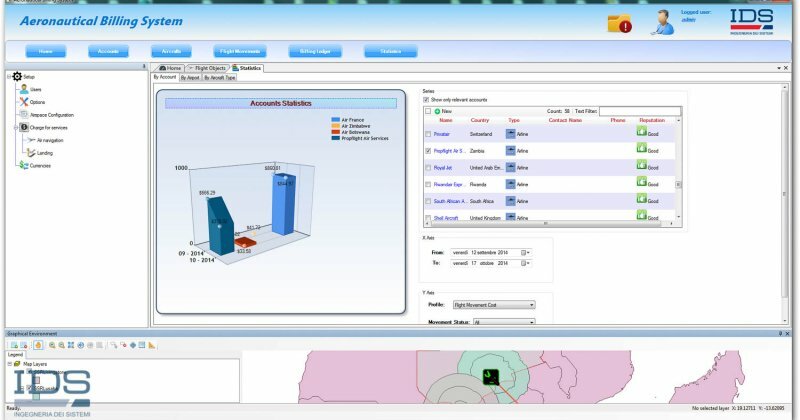 In addition, use of statistical analysis of past revenue performance can help to improve processes and aid with future planning. 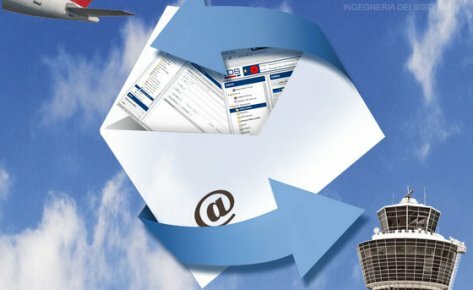 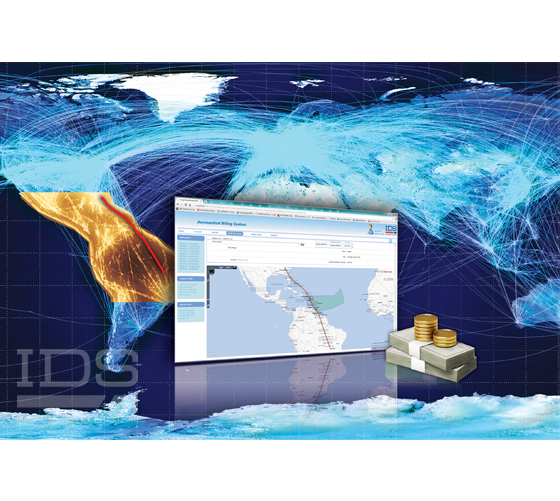 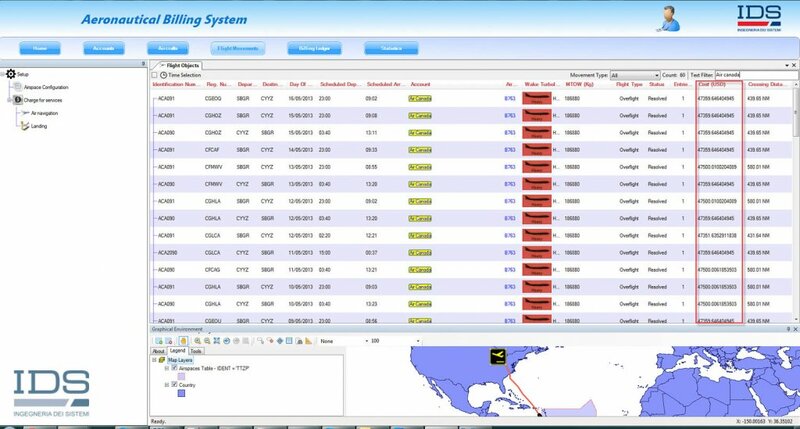 A-BMS provides a single solution for aeronautical billing, with relational databases of airspace users, their account status, aircraft and flight info, the ability to automatically generate invoices, keep track of them and take payments as well as generation of various types of statistics. 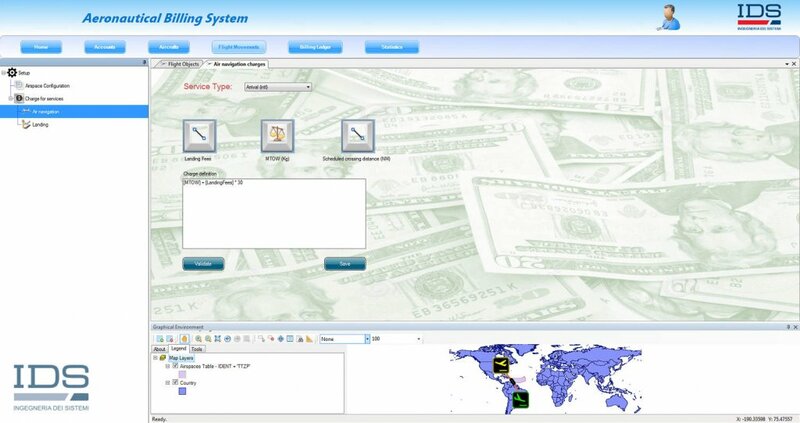 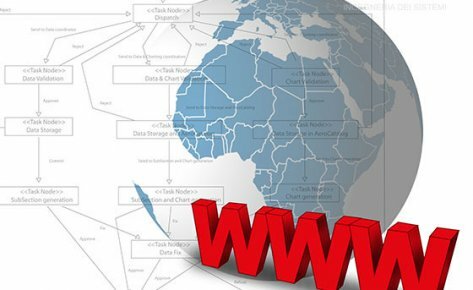 Flexible deployment of a system scalable to meet customers’ requirements via either a standalone system or a central database with local users. 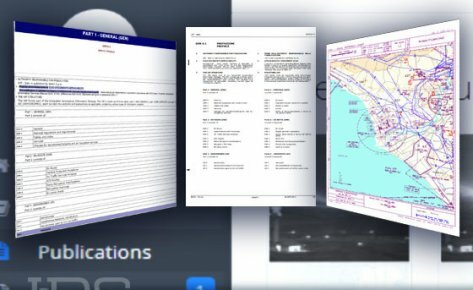 Account Management: A relational database of individuals and organizations who should be invoiced for their use of Air Navigation Services. 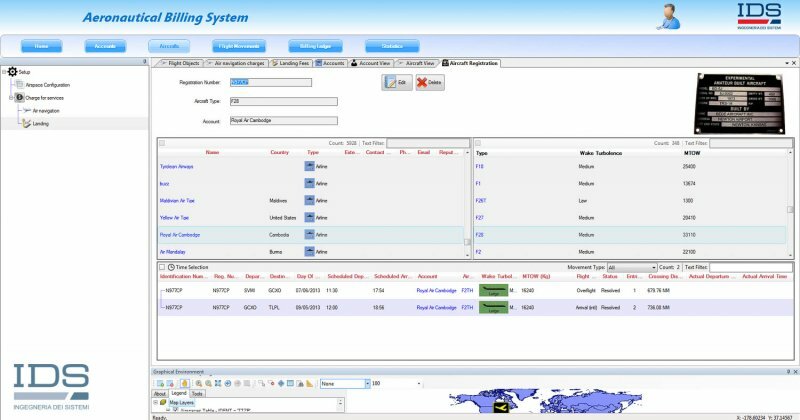 As well as account attributes, Account Management displays a consolidated view of all associated data including aircraft details, flight movements, billing ledger records, etc. 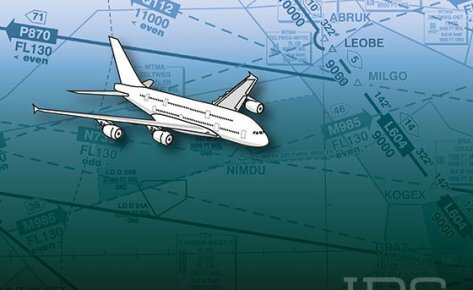 Aircraft Management: Provides a database of known aircraft, identified by their registration number, their association to an account and their characteristics including ICAO Doc 8643 and manufacturer information. 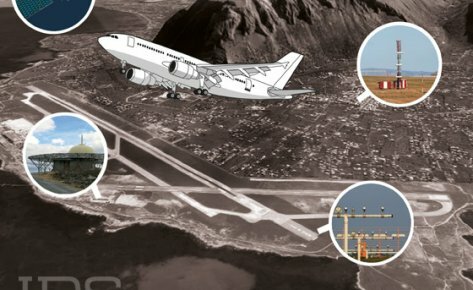 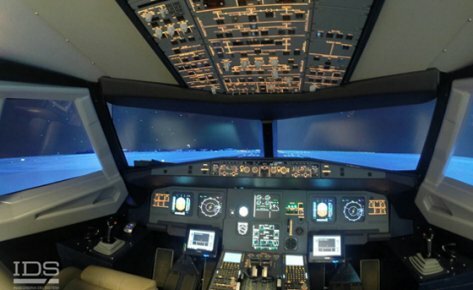 Flight Movements: A database of flight movements which may combine flight information taken from multiple sources including AMHS/AFTN and RDPS/FDPS. 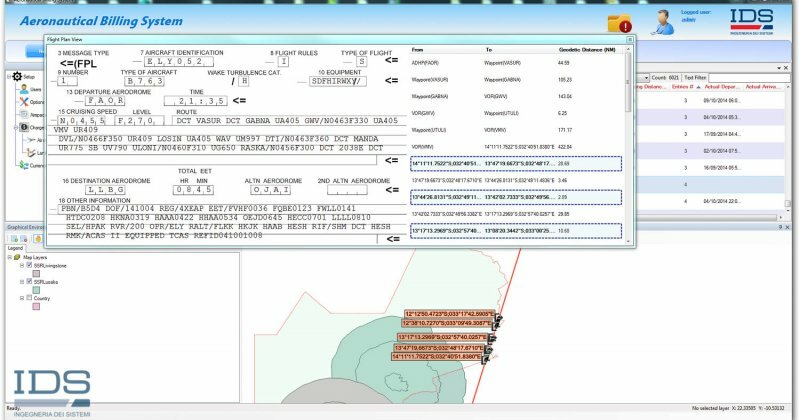 Flight movements are associated, if possible, with a known account or aircraft, an invoice is generated and a billing status assigned. 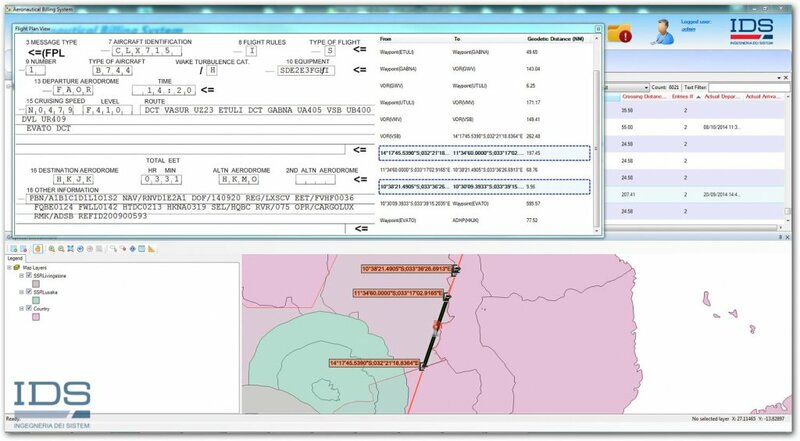 A web-GIS interface displays the route from the flight plan and the path from the surveillance. 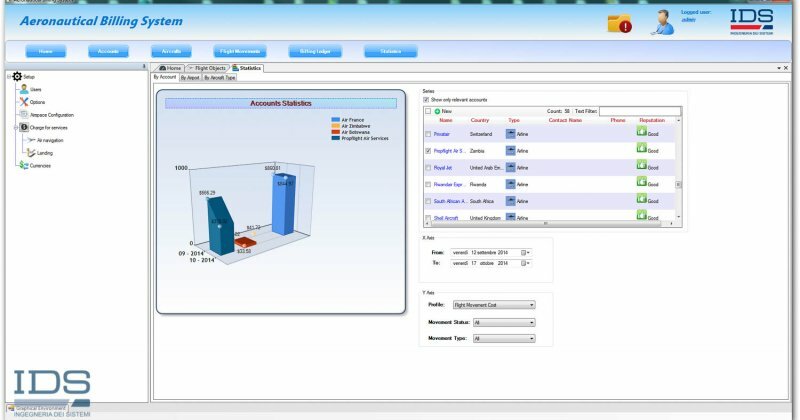 Billing Ledger: Records billing transactions including invoices, payments, credit notes and debit notes. 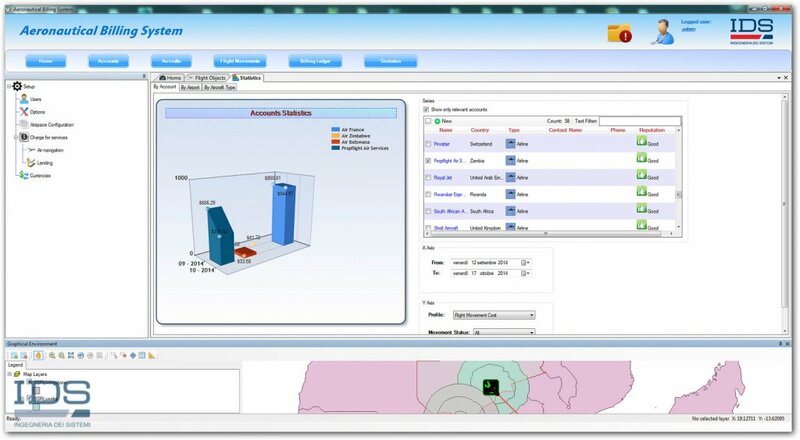 Charges are determined using customizable formulas and invoices, which can have maps appended, can be generated and distributed via email automatically or on demand. 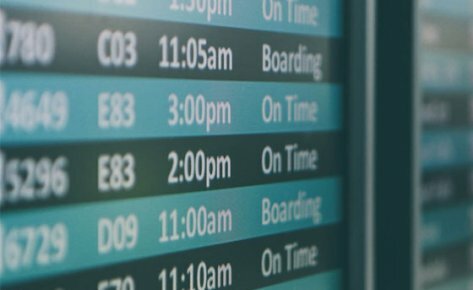 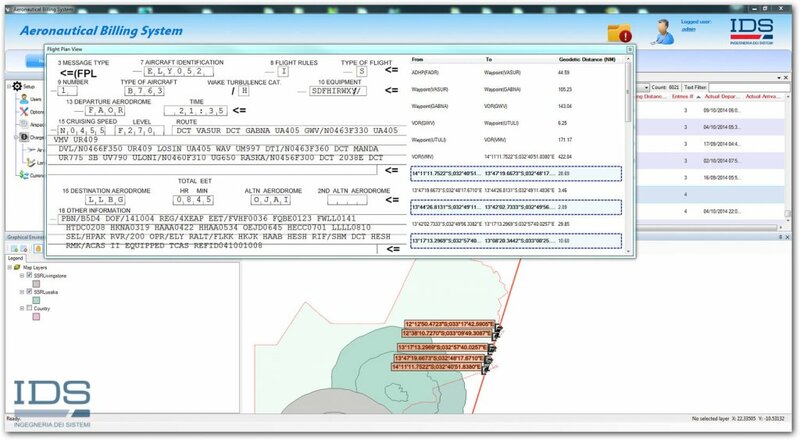 The Billing Ledger supports the new IATA ISXML format. 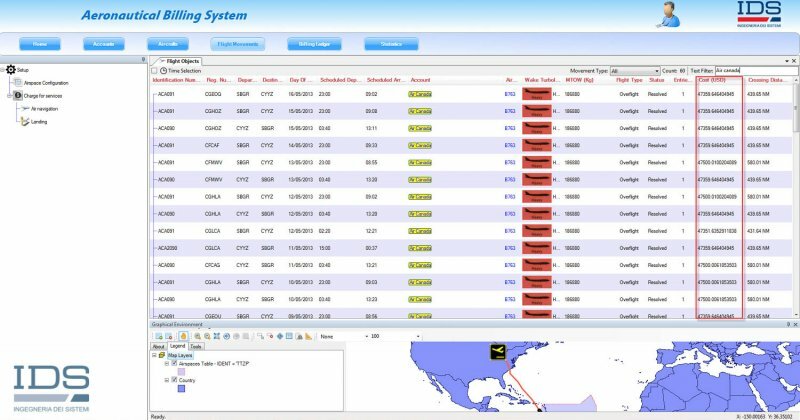 Blacklisted Aircraft Warning: Correlates real-time information coming from the Flight Planning system (AMHS/AFTN) with the billing system and provides a warning of any airspace users attempting to file a new Flight Plan whose account is blacklisted as being in arrears. 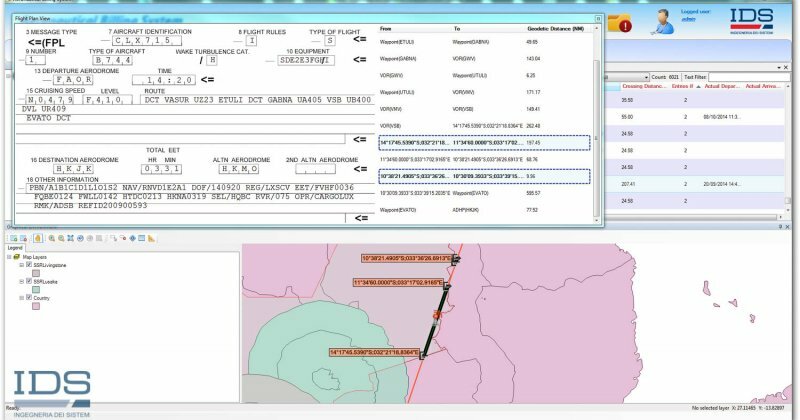 This allows the ANSP to take the appropriate action, issue warnings or initiate general procedures which can include the automatic generation of a Flight Plan Cancelation message (and/or NOTAM). Reports and Statistics: Various kinds of reports can be customized and generated on demand from stored data in a number of formats including HTML, CSV, PDF, etc. 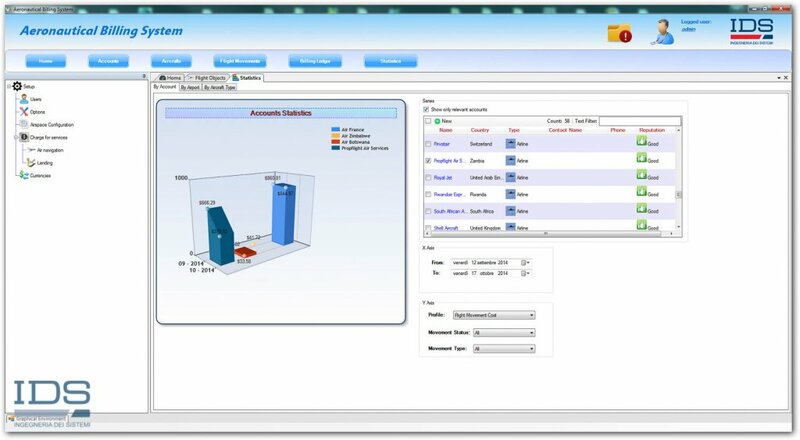 Statistics can also be produced and displayed graphically as bar, pie, line or tabular charts. 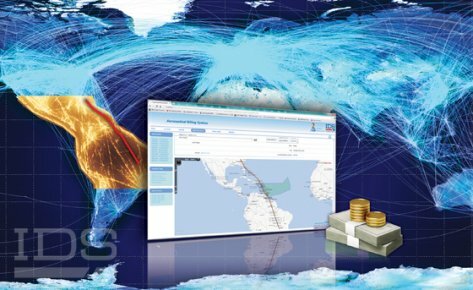 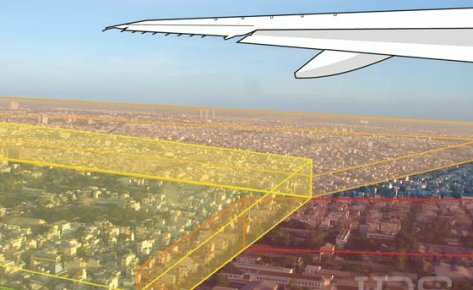 The types of statistics that can be generated include airspace usage, traffic volumes, economic values (airlines, general aviation, aircraft types and routes) and account status. External Customer Portal: An online portal which allows general aviation users to register accounts and aircraft and to access account information. 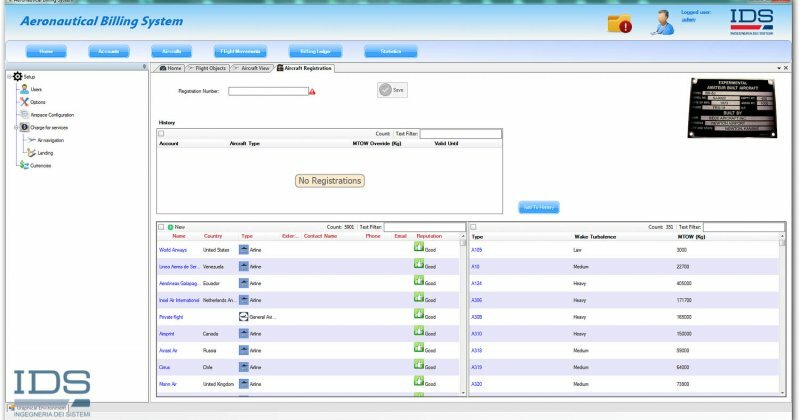 Provides automatic notification of outstanding balance via AFTN messages and enables online payment for pre-payment or individual invoices.